"We may be the most child-sensitive generation of parents the world has ever known Üand the most confused and insecure." But it doesn't have to be that way. We can be both sensitive and in charge. We don't have to model our family on the consumer society where our kids become "consumers of parental services" and we become the "servers" with customers who are always right. Dr. William Doherty is convinced that it is possible to be a thoroughly modern parent - who values each child's sensitivities and developmental needs - while still having high expectations for children as persons who have responsibilities to family and community. He shows you how in Take Back Your KidsÜa timely, yet timeless, confidence-building book that backs up fresh insights with personal experience and advice parents can rely on. This popular faith primer and handy companion for all who wish to know more about the Catholic faith now corresponds with the Catechism of the Catholic Church. It is arranged along the four pillars of the Catechism: The Profession of Faith, The Celebration of the Christian Mystery, Life in Christ, and Christian Prayer. Questions for discussion are presented. Prayer exercises help the reader understand that knowledge of the faith draws one closer to the Lord. This catechism is specifically designed for Catholic adults, for those new to the church, and those journeying through the RCIA. Designed to help couples plan their ceremony, it contains the complete marriage rite with all variant prayers, blessings, and scripture texts. Full-page commentaries by Father Champlin on each of the 28 readings make Together For Life ideal for pastors to distribute to couples taking marriage instruction, for pre-Cana, college and high school marriage classes, and newlyweds. Both editions include a 4-page selection sheet for choosing readings, prayers and blessings to be used in the ceremony. Writing about her own journey as a widow, Curry helps others deal with theirs. She establishes eight practical guideposts for getting through the first year and deals with a variety of topics including the stages of grief for adults and children, the expressions of mourning, loneliness and sexuality, financial priorities and planning, good health practices, and the importance of spiritual growth to the healing process. 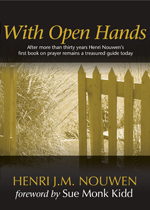 Take a new look at With Open Hands, Henri Nouwen's first book on spirituality, and a treasured introduction to prayer for over thirty years. With Open Hands gently encourages an open, trusting stance toward God and offers insight to the components of prayer: silence, acceptance, hope, compassion, and prophetic criticism. Provocative questions invite reflection and self-awareness, while simple and beautiful prayers provide comfort, peace, and reassurance. With over half a million copies printed in seven languages, we've updated this spiritual classic for a new generation with moving photography and a foreword by Sue Monk Kidd.